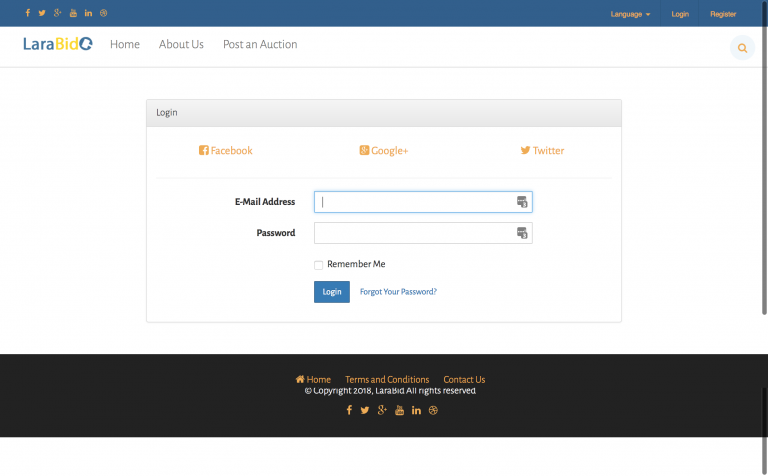 LaraBid is a professional PHP auction script let your customers buy the product by winning bid. 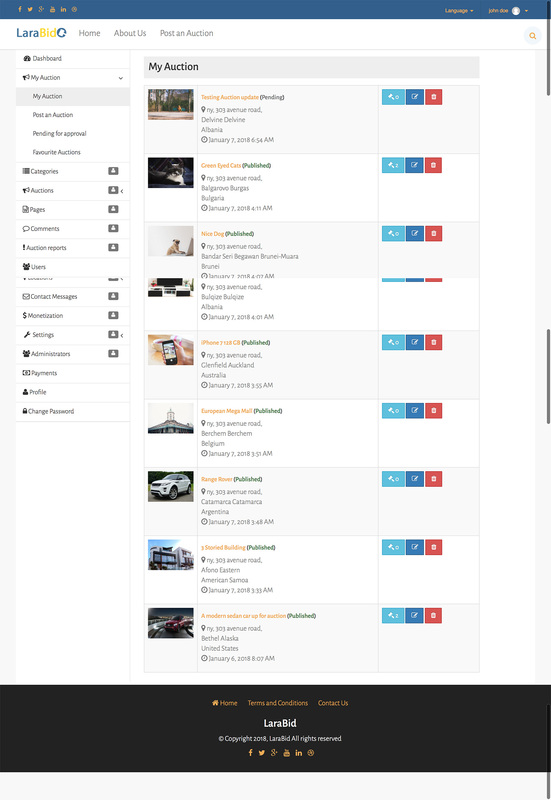 With LaraBid PHP auction script, you can add unlimited categories to categorize your product that way it should be. This PHP auction script allows you to track the bid and bidders. The auction platform owner can earn by promoting auction ads and monetize website using Google Adsense. LaraBid has some cool features and lets us describe. LaraBid PHP auction script allows you to sell the product at the possible highest rate by auction. Seller will add a product for sale and Potential buyers will bid on the product until sold. The seller can select the winner from his dashboard manually if he wants. In this PHP auction script, there is no limit to sell the product. You can sell the unlimited product. 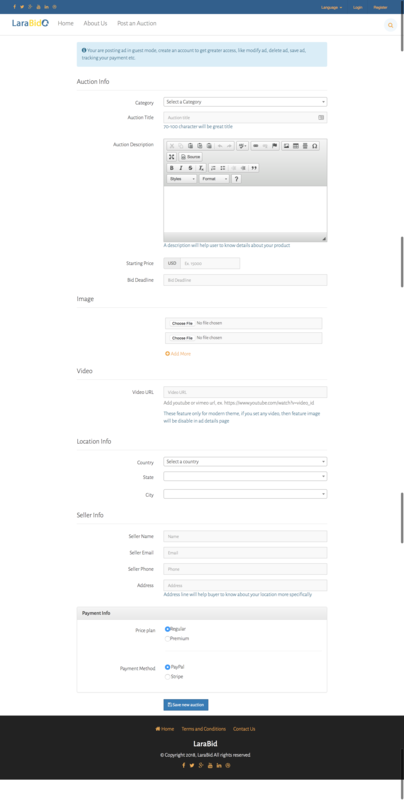 This PHP auction script has a beautiful image gallery for showcase the product and gets look originally the product has. Laravel built with the latest technology and it’s powered by PHP laravel framework which is dominating the PHP market at this days. It’s the up to date technology and most popular PHP framework. The seller can add a premium auction to get more attention from buyers by paying specific premium auction fee, platform owner must have to set the cost of premium auction posting. With every auction ads, bid closing time will show with a countdown, so the potential customers may aware of the bid end time. For the quick share it to social media, we’ve added the social share features and any visitor can share an auction from the details page directly. LaraBid comes with translation ready and everyone can translate the website using a simple doc that we’ve included with the package. To sell the products at the honest price, you can set a starting price, so bidders bid will start from that price. A seller can add an intro video from YouTube or Vimeo with the ads if he wishes, it will get more attention from the customers. 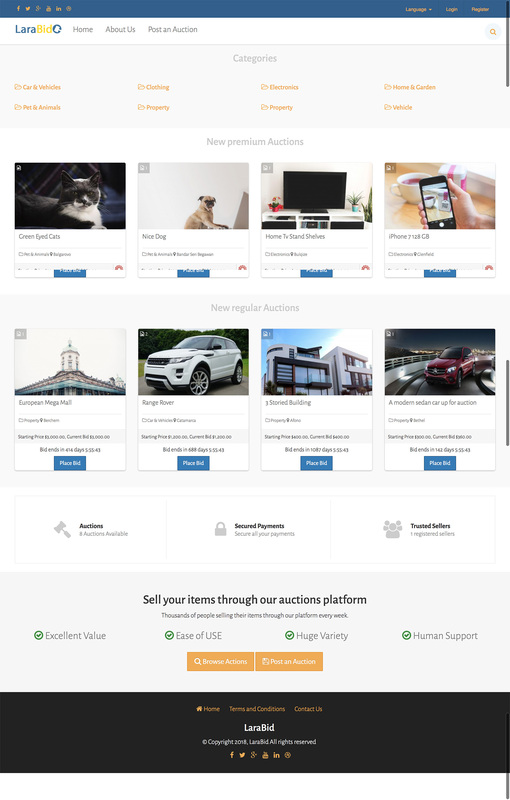 To make transparent of every sell, LaraBid included the bid history in the auction details page, every user can see the bid history live and the potential bidders will know how much price should place to win the auction. LaraBid comes with the free update since release and it will be free for the lifetime with every purchase. Get this professional PHP auction scripts at the low price.